Hello there! 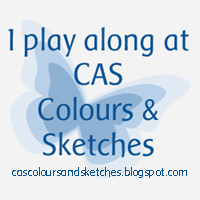 It’s sketch week at CAS Colours & Sketches and we have a nice little one for you with some simple shapes. 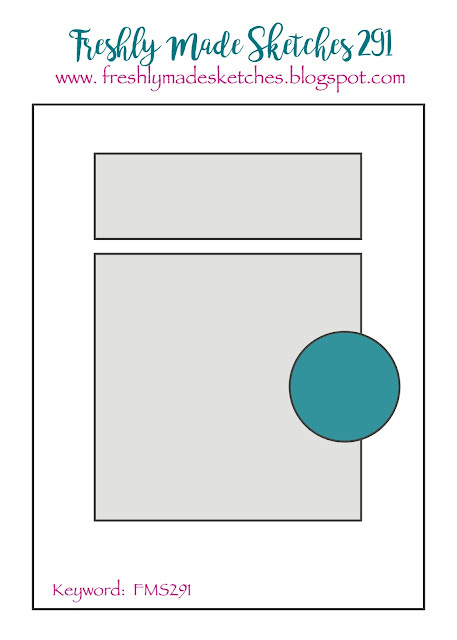 As I was looking through my stamps, trying to figure out how to use the oval shape in the sketch, I came to a set that has several speech balloons. I decided it would be fun to use one of them for the oval, but realized then I’d need something to be speaking. So I added a couple of cute little birdies to dress up the sketch a bit. 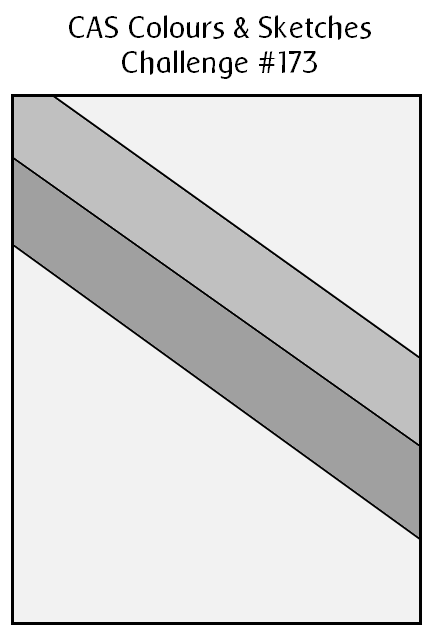 I picked out designer paper for the stripes of the sketch. 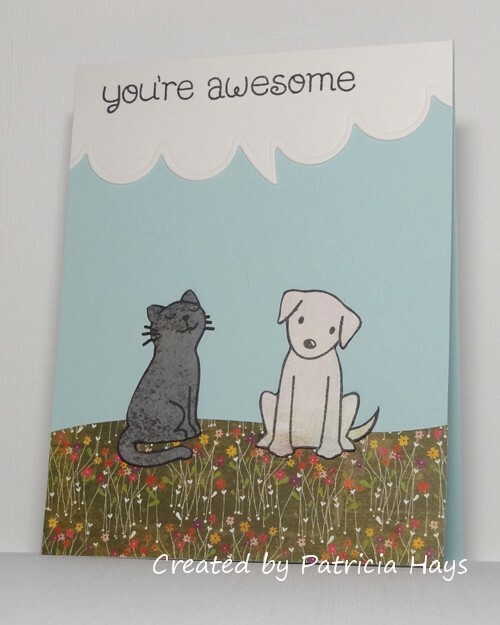 I had coordinating scraps that were just the right size for the speech balloon and the birds, so I stamped them and fussy cut them to add to the card. 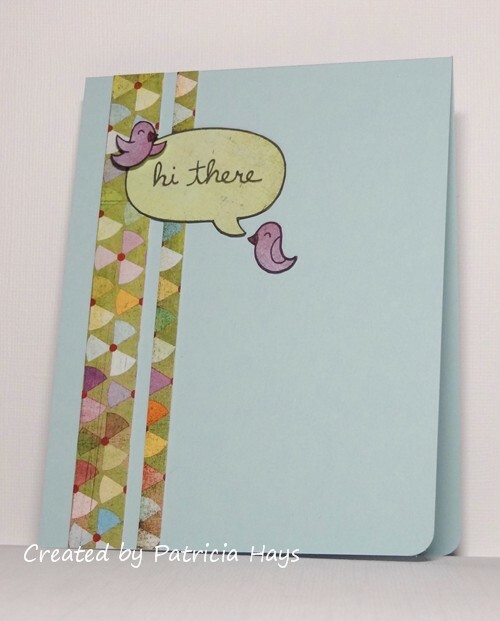 The bird on the left is attached with a pop dot to give a little dimension to the card. 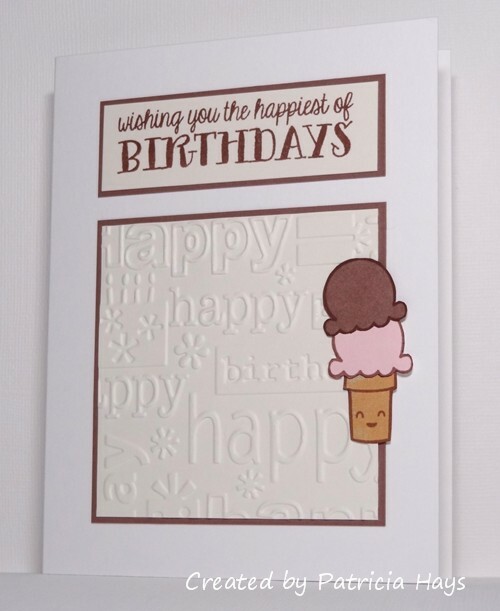 As I was getting ready to take the photo of the card, I thought it needed a little something extra, so I made a literal last-minute decision to round the bottom right corner of the card to echo the shape of the speech balloon. It’s a tiny detail but I think it does perk up the card. 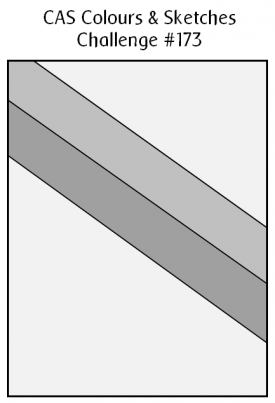 What will you do with this sketch? There are so many possibilities! 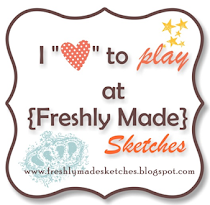 I hope you’ll try out something and share what you create with us! 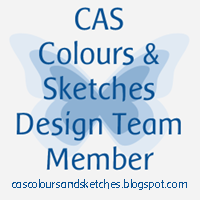 Link your work to the CAS Colours & Sketches blog by 6:00 p.m. Eastern time Monday, July 17. Thanks for stopping by today! Hello! 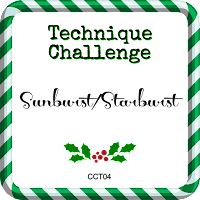 Today’s post is to serve as a reminder that we have a fun technique challenge going on at Christmas Card Throwdown. 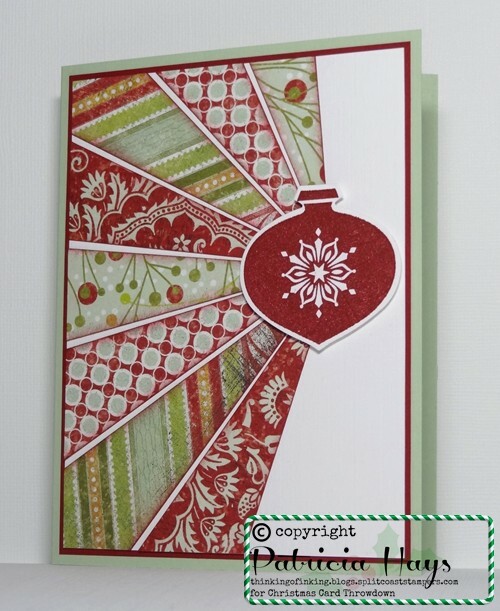 We’re hoping you’ll join us in creating Christmas or wintry cards using the starburst (a/k/a sunburst) technique. 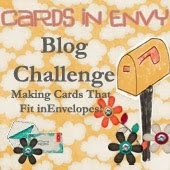 I’ve created a second card for the challenge, and I’m sharing that today. 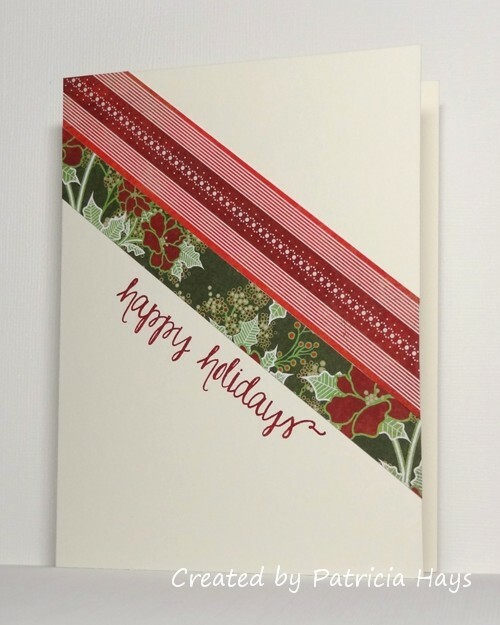 I used four different designs from a Basic Grey collection of holiday patterned papers. 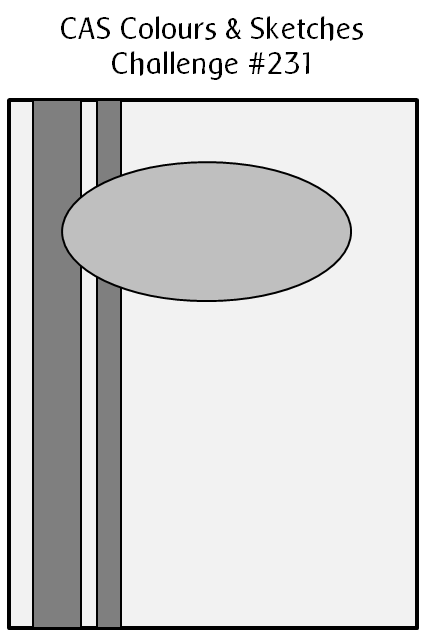 I cut them into long, narrow rectangles and then cut the rectangles diagonally to form triangles. I sponged the edges of the triangles with cherry red ink. I fanned the triangles out over a piece of white linen textured cardstock, letting a little of the white show between the triangles. When I was satisfied with the arrangement, I used double-sided tape to adhered the triangles to the white base. After trimming the excess off the panel, I attached my starburst panel to a piece of cherry cardstock, which I then attached to the pale green card base. The ornament image covers where the points of the triangles meet; I’ve attached it with dimensional adhesive to keep the card from feeling too flat. Thanks for stopping by today! Remember, you have until 7:00 p.m. Eastern time Friday, March 3 to share your own starburst card at the CCT site. 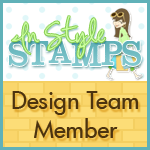 Posted by PH in VA at 1:00 am Basic Grey, Cards, Christmas Card Throwdown, Stampin' Up! 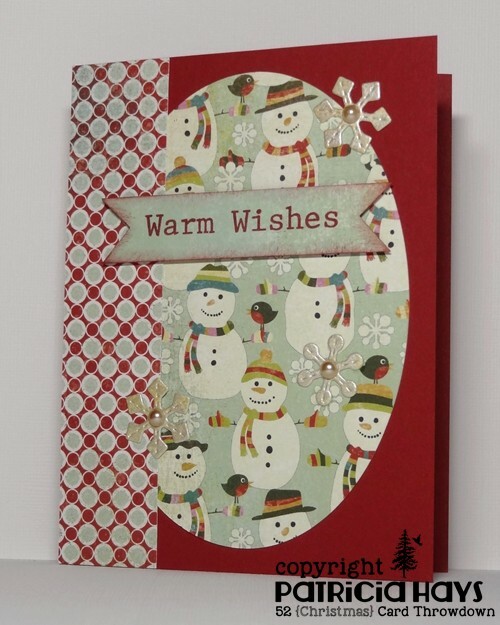 I decided to go with a snowman theme for my card. 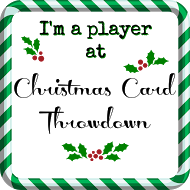 It ended up using the not-so-snowy, traditional Christmassy colors of red and green. Usually I sponge the edges of the triangles when I do this technique, but I opted not to take the time to do that this time. 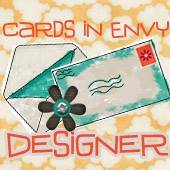 Be sure to check out the cards the Design Team has made. 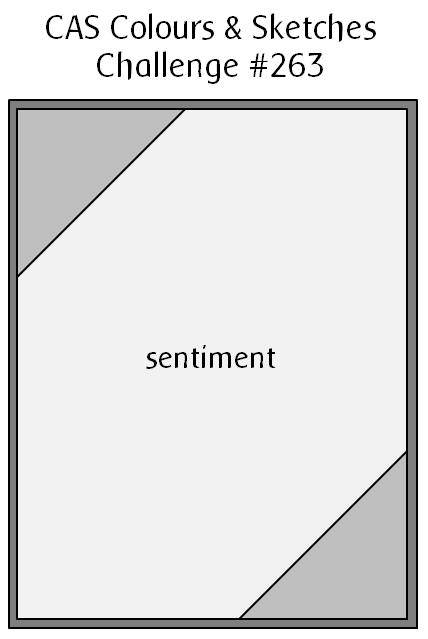 Then create your own card using this technique, and share it with us at the CCT site by 7:00 p.m. Eastern time Friday, March 3. We’d love to see your take on the technique! 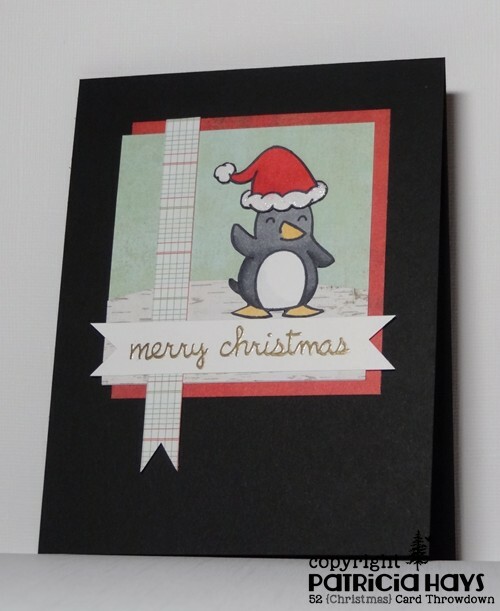 Posted by PH in VA at 1:00 am Basic Grey, Cards, Christmas Card Throwdown, Hero Arts, Lawn Fawn, Stampin' Up! Hello there, and happy Saturday to you! 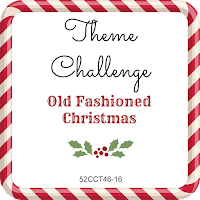 It’s time for another theme challenge at 52 Christmas Card Throwdown and this week we’re looking for cards that depict an old fashioned Christmas. 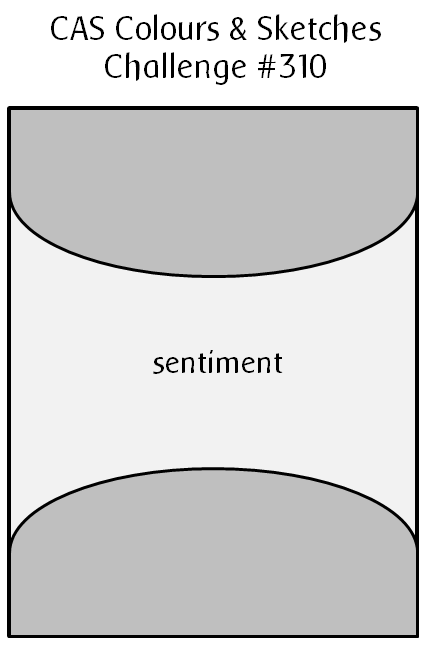 This can be interpreted in a number of different ways – vintage, retro, or traditional. 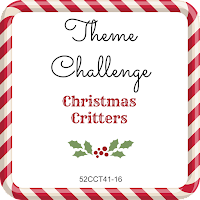 I didn’t know what I was going to do for this challenge until I remembered I had designer paper that showed ornaments that, to me at least, looked like something from the 1950s or 1960s. 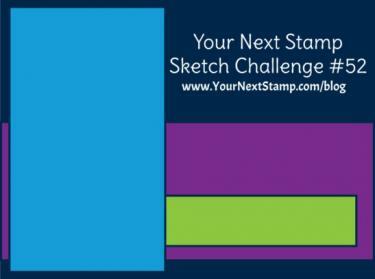 I looked around the internet for sketch ideas and found the current challenge at Your Next Stamp. I had a scrap of the ornament paper that fit perfectly into the sketch, so I decided to give it a try. The package of designer paper has coordinating solids (well, actually a very subtle variegated print, but mainly solid) so I used a burgundy and an olive green to supplement the ornament paper. 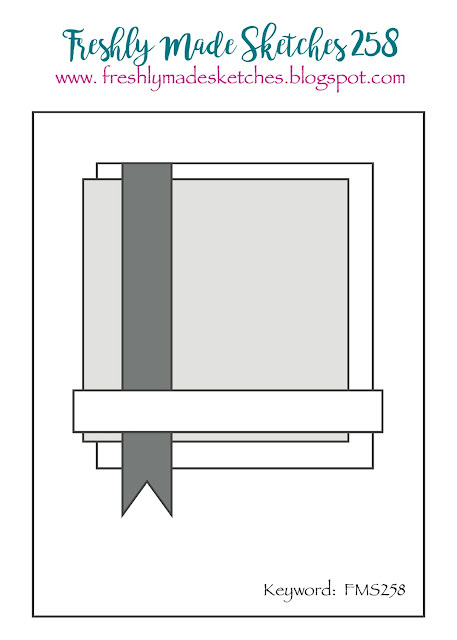 The designer papers did most of the work for me! 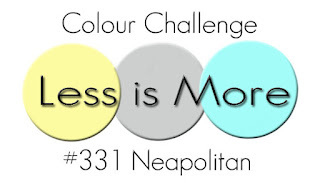 If you need additional inspiration, go on over to the 52CCT blog and see what the rest of the design team has made. Then show us your own interpretation of an old fashioned Christmas by linking a card of your own to our challenge post. 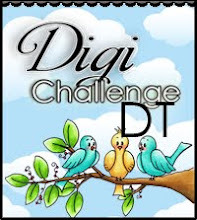 You have until 7:00 p.m. Eastern time Friday, November 25 to enter the challenge. Thanks for stopping by today! Hello! 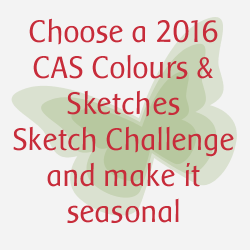 It’s the first Saturday of the month, which means it’s sketch challenge time at 52 Christmas Card Throwdown. 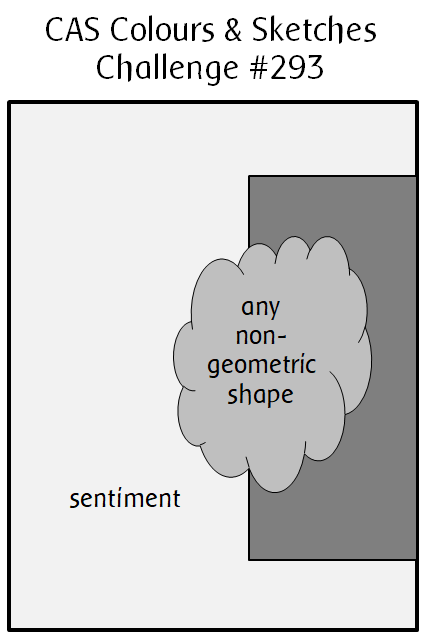 Our sketch this week has some fun layers and shapes to play with. 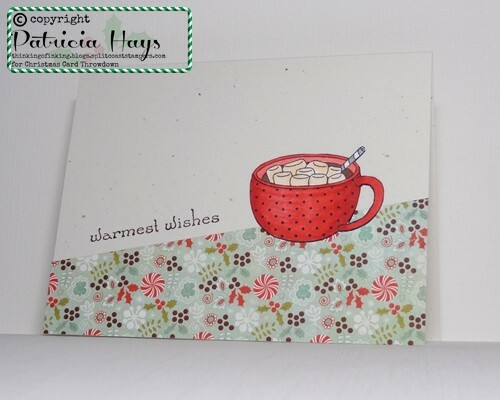 For my card, I decided to use some of the wintry designer paper I’ve been hoarding. I’m not sure why I’ve been so reluctant to use it. Maybe it’s because the snowmen are so super cute, I didn’t want to use them up. 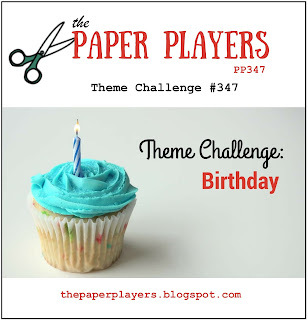 I’ve paired that designer paper with a coordinating print and a banner made from a coordinating solid-ish paper. I sponged the edges of the banner with the same color ink I used to stamp the sentiment. 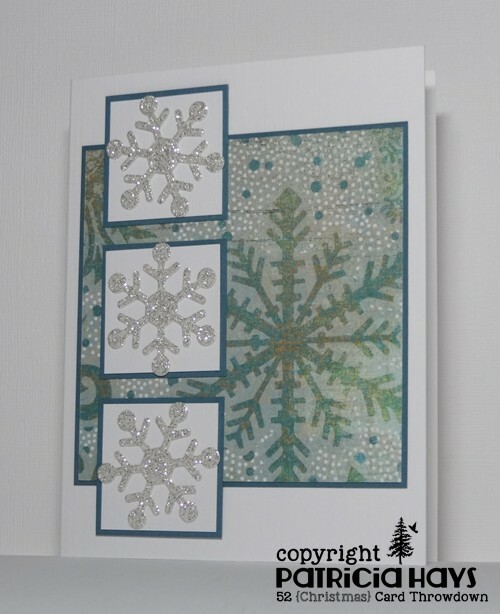 The snowflake embellishments were die cut from another coordinating solid and brushed with shimmery paint. In real life, they show up from the print papers better than they do in the photo. I added a pearl to the center of each snowflake for the finishing touch. 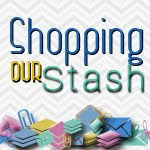 Be sure to check out what the rest of the 52CCT design team has made! 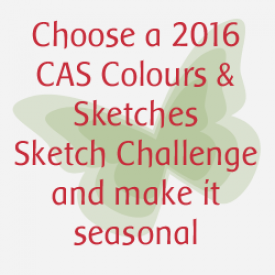 Then make your own wintry or Christmasy card using the sketch, and share it with us using the linky tool at the challenge post. 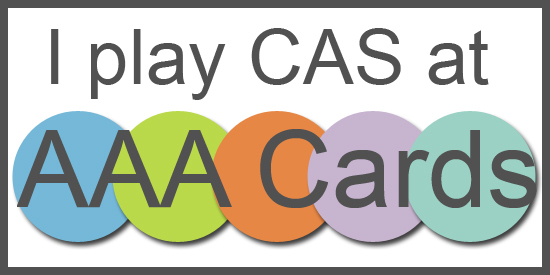 You have until 7:00 p.m. Eastern time Friday, June 10 to link your card. Thanks for stopping by today! 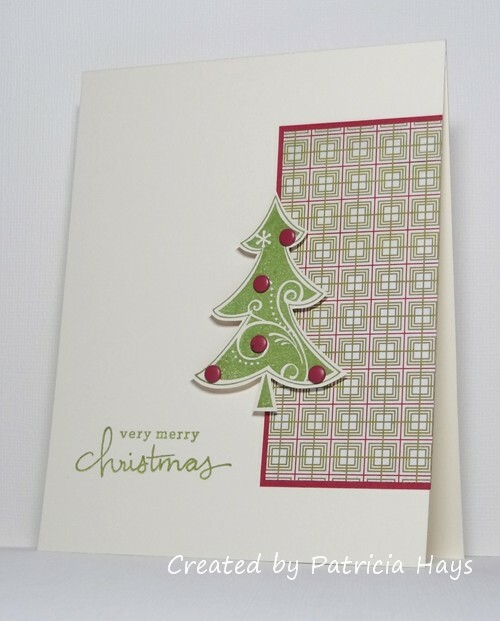 Posted by PH in VA at 1:00 am Avery Elle, Basic Grey, Cards, Christmas Card Throwdown, Stampin' Up! Hello! 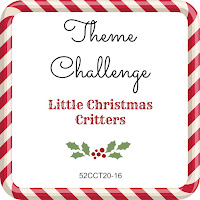 It’s theme week at 52 Christmas Card Throwdown, and this time we’re looking for cards with little Christmas critters. So long as your card features at least one small creature, it’ll meet the challenge theme. I decided to use one of my Lawn Fawn stamps that doesn’t get a whole lot of inky love. I do think it’s cute, but it’s a bit of a pain to paper piece and I wasn’t in a mood for coloring. But I went ahead and pieced my scene from various designer papers and cardstock. For the bunny, I worked with a scrap of caramel brown cardstock to loosen the fibers in it, and then gently pulled the front and back apart into two pieces, to achieve a bit of a fuzzy texture. 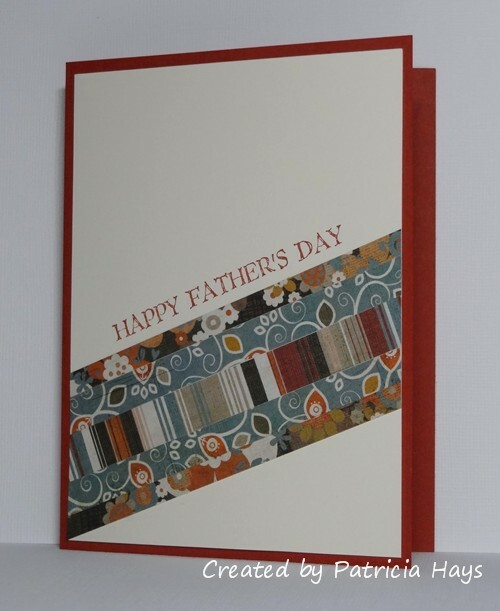 The card base is textured cardstock, although I’m not sure the texture shows in the photo. 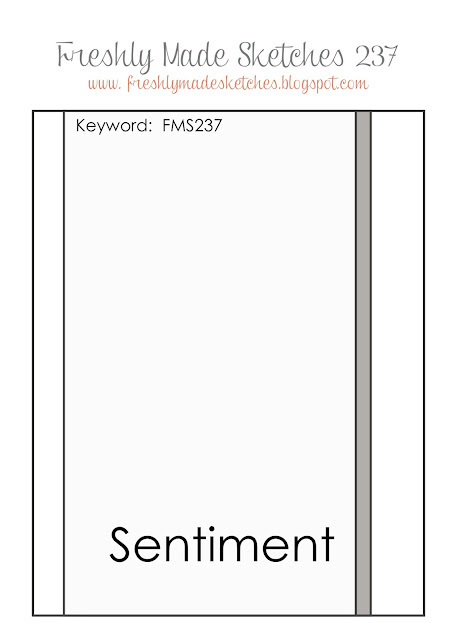 The layout for this card is this week’s Freshly Made Sketches challenge, squashed into a landscape-oriented rectangle. 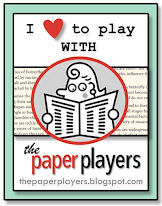 What kind of Christmas critter will you use on your card – animal, elf, child? There are so many possibilities! Check out the design team’s makes if you need further inspiration. 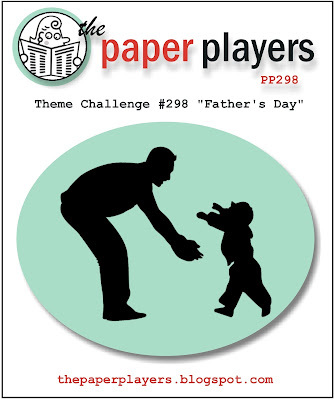 Once you’ve created your own card, link it to the 52CCT website by 7:00 p.m. Eastern time Friday, May 27. 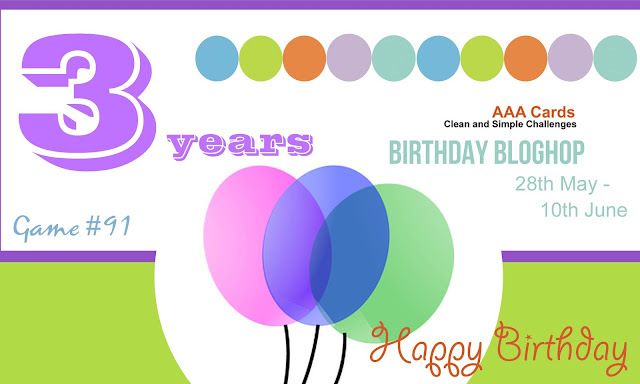 We’d love to have you join us! 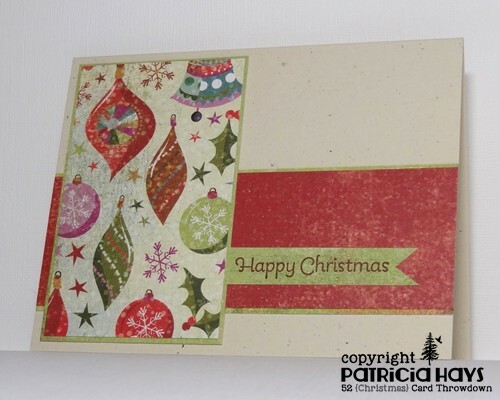 Posted by PH in VA at 1:00 am Basic Grey, Cards, Christmas Card Throwdown, Freshly Made Sketches, Stampin' Up!